An illuminating exhibit is the ‘Joe Mercer Collection’, where memorabilia from that great captain is displayed. Mercer signed as a wing-half in 1946, when the club was struggling badly just after football had resumed in earnest following World War Two. Along with Ronnie Rooke, Mercer’s arrival coincided with an upturn in results that ensured the Gunners maintained their position in the First Division. Next season he took over as captain and drove the team to the League title along with the 1950 FA Cup triumph, and another league title in 1952-53. Joe continually put off retirement, but at the age of 39, injury stopped him playing as he broke his leg against his home town club, Liverpool, in April 1954. Amongst a number of eclectic items, this section contains these two highly impressive items. In September 1947, former Arsenal star Charlie Buchan and a group of British football journalists formed the Football Writers’ Association. This group proposed that an annual award be given ‘to the player, who by precept and example on and off the field, shall have been considered to have done most for football during that season.’ The winner was chosen by vote of the Association’s members, and the first winner in 1948 was Stanley Matthews. 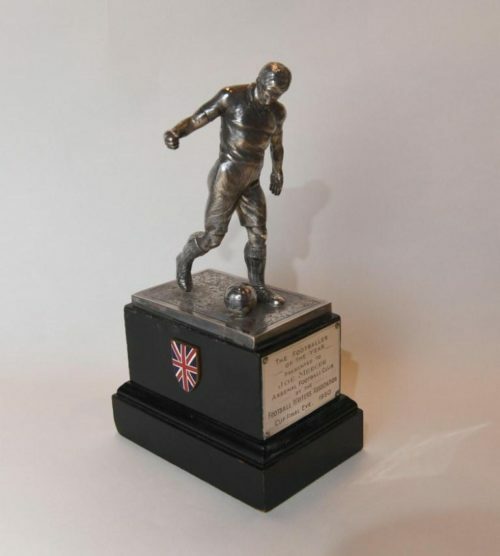 The 30cm tall bronze trophy depicts a diligent, yet graceful, right-footed player about to kick a ball on a marble plinth, adorned with a Union Jack shield. 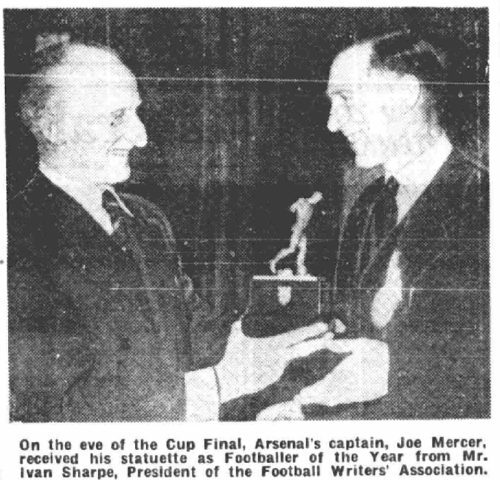 In April 1950 Joe Mercer, aged 35, was voted by the FWA, as their Footballer of the Year. By all accounts Mercer was a run-away winner owing to his excellence on the pitch and humility off it, a very worthy winner of the most prestigious individual honour bestowed in English football. He received the award on the eve of the FA Cup final at the FWA annual club dinner where Joe was presented with the trophy by the President of the Association, Ivan Sharpe. A far cry from the lightweight “balloons” of today, it is made of heavy brown leather which, when wet, felt like a rock to those brave enough to head it. 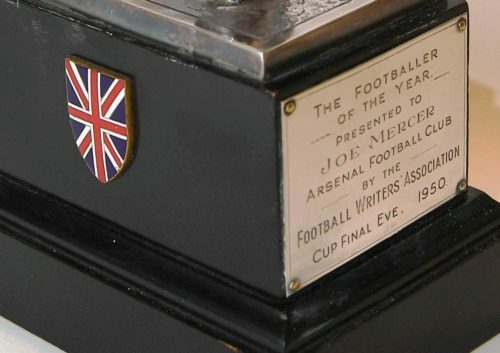 It has “Arsenal 1950” inscribed on the central panel and, underneath, signatures of all the players who appeared at Wembley. 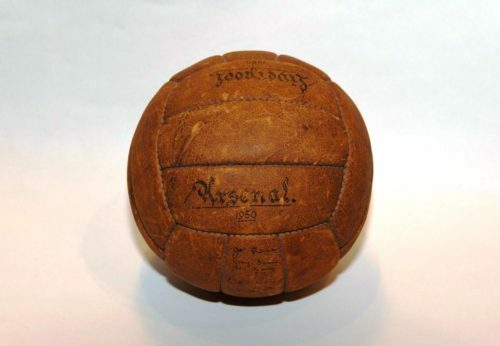 This was the ball with which Reg Lewis hit a brace, allowing Mercer to hold the cup aloft at Wembley, bringing it back to Highbury for the third time. FA Cup Final ball 1950. Arsenal Museum. 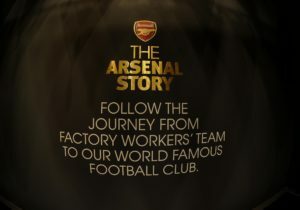 Credit : Arsenal Football Club / David Price. On 29 April, resplendent in their old gold kit specially designed for the final, Arsenal dominated the match adapting to the slippery conditions following incessant rain beforehand, and Liverpool were second best all through the tie. Lewis’ first goal was a simple tap-in following a combination of passes masterminded by Jimmy Logie. Lewis’ second goal was nearly identical to his first and capped a great team effort. The win was a bittersweet moment as Mercer, who still lived in Liverpool, trained at Anfield and knew the Merseyside team well.